Learning To Fly climbs the overhanging face along the thick shadow. I'm happy to report on a recent send (bouldering) in Harpers Ferry. Brian Spiering is reporting that on November 26, 2011 he was able to make a stand start ascent of the New Dawn Project. You can view a video of Brian sending the problem at http://vimeo.com/32724355 . "New Dawn" Project of Harpers Ferry from Thrice on Vimeo. A time lapse of some local climbers on some local rock. Balcony Jr. is included in this series of images. Credits to Indy. 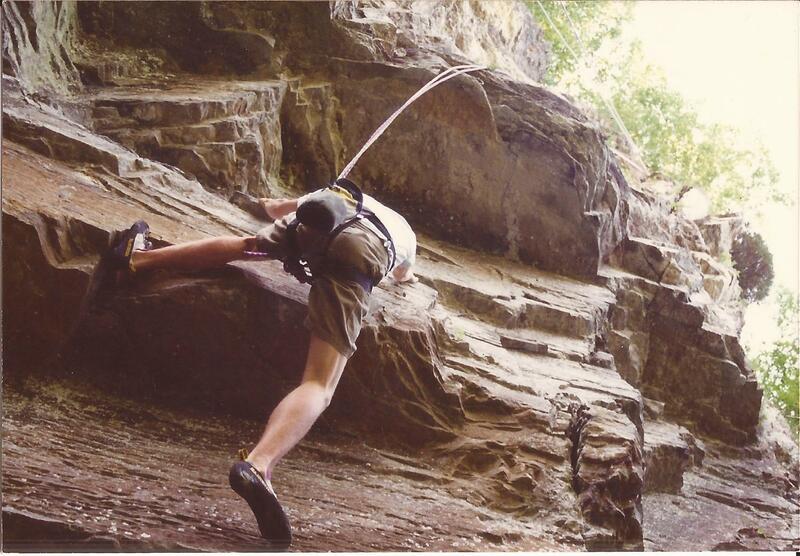 Climb Maryland: A Time Lapse View from Mark Kochte on Vimeo. Photos of Snow and Fall Foliage in the Harpers Ferry Gorge. Just one of the old standby boulders in the snow. 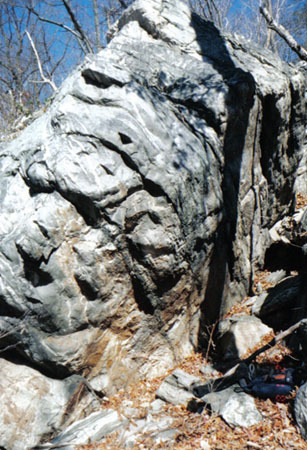 I'm happy to report on some recent bouldering activity in Harpers Ferry. Alex took a quick phone pic of the problem. It's overhanging, bad holds, bad feet, longish moves, and pretty rock. You can catch site of this problem in the Harpers Ferry Climbing Tour Part II video when a hand comes into view on the starting hold. Admittedly the pic doesn't do it justice, but it's a glimpse none the less. Alex Brown and his buddy Ethan have been working on sending projects and repeating established problems. Alex reports that he and his buddy Ethan have been focused on the Harpers Ferry Super Project problem #61 in the Highlands and successfully climbed the problem on Monday (8/15/11) morning. Alex suggests it is about V8/9 in difficulty and is calling it "Learning to Fly". They have also repeated "The Underground Railroad" and both think V7 is a good rating for the problem. You can read Alex's account below. Learning to Fly is the now the most difficult bouldering problem to be climbed at Harpers Ferry, to my knowledge. 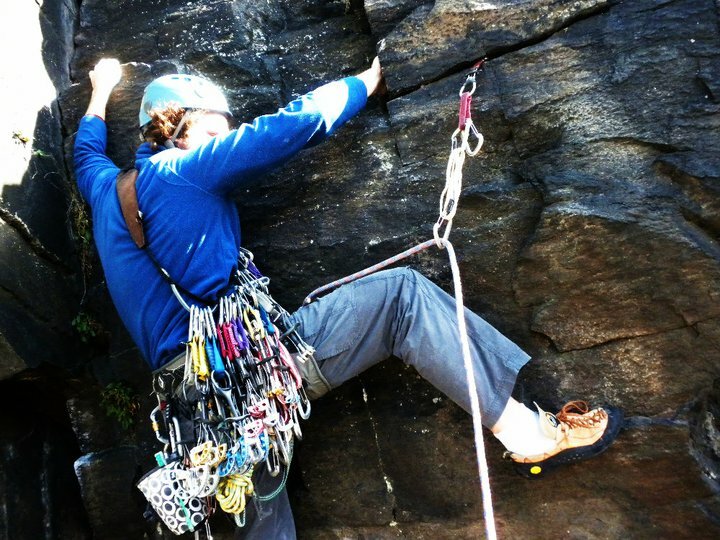 If you are visiting Harpers Ferry to climb and find that you have forgotten gear or need a new piece then check out these local shops. The Trail House and Mountain Trails both carry climbing gear. The Outfitter in Harpers Ferry does not carry climbing gear. Below, you'll find a Website, Address, Phone Number, Hours, and a Google Map for the stores. I've completed some updates to the guide information for the coming Fall season. Though the summer heat makes it seem as though we will forever roast, better temps are on the way. 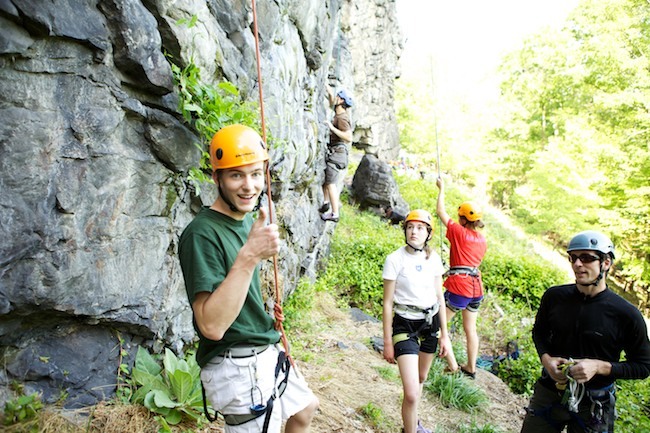 Make sure to check out the updates (see below) so you can maximize your Fall climbing experience in and around Harpers Ferry. Sure beats the view from the office. 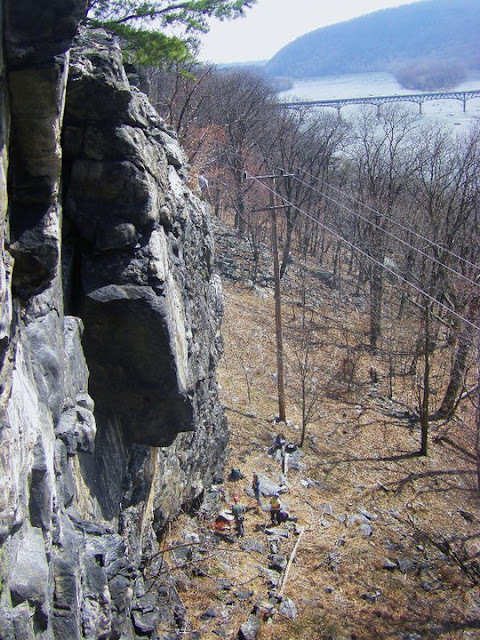 Rappel station on Loudon Heights. Available in a 3x4.5 inch size. Available in a 3x4.5 inch, and a 4x6 inch size. See the previous post HERE for a photograph of the 4x6 inch sticker on a vehicle. 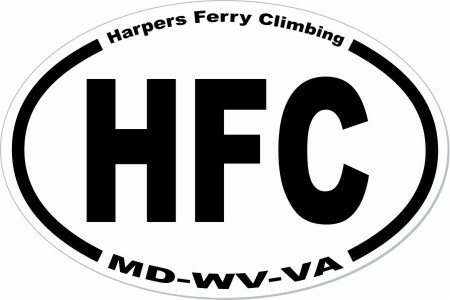 Contribute to anchor maintenance and placement in Harpers Ferry by purchasing an oval international style sticker. All profits from the sale of these stickers will go to anchor maintenance in the gorge. Shipping priced for United States only. Enjoy some images of Harpers Ferry from a variety of angles within the gorge. 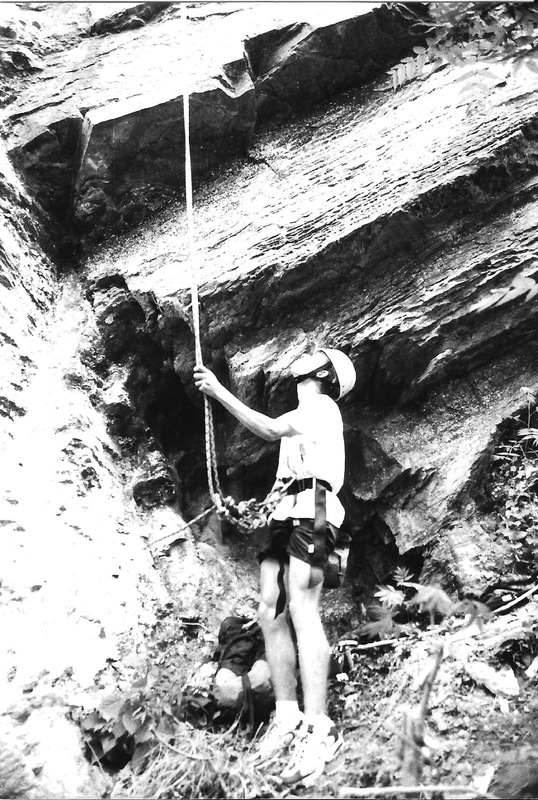 The first photo captures a climber with all of the traditional climbing gear. These photographs were taken by Carl Orr. I met Dennis after work yesterday for some climbing at Loudon Hts. We parked at the trailhead in the large lot just down from the gas station & hiked to the top. Double ropes got us down from the bolts, which we then pulled & I began racking up for a new (for us, at least) route. The climb followed the discontinuous cracks left of the East-facing dihedral up to a tree with an established rap station. Along the way, I encountered many spiders, a couple of brick-sized loose blocks, lots of lichen... but also sweet layback flakes, finger/ hand jams & near the top of the pitch some stemming & an off-width. A quality line bottom to top, with varied, fun climbing throughout its length. Adventurous 5.6 G, standard rack + a #5 cam for the top. There is a short pitch above, which I've climbed previously as a variation finish to another climb; yesterday, we simply rapped back down (single rope) to the bottom. One of the loose blocks I was able to safely remove on lead, the other on rappel. We finished the day on the arete & crack to the right of the dihedral (I led the arete, but placed gear so Dennis could finish on the crack). Ball nuts or micro cams will keep you from tumbling down to 340 if you blow the opening moves. Except for the top of the cliff where we started, we were in the shade the entire time. With sunset upon us, we opted to rap down at the wide-spot cliff & follow the road back. Today was a fine summer day for hanging out in Harpers Ferry. It began with a trip to Shepherdstown, as usual, for some coffee, breakfast, and a sandwich for lunch. I then drove down to Harpers Ferry and parked at the Widespot below Loudon Heights. Due to some litter issues this area has been reduced in size. The first half now has No Parking signs and the second half appears to be open for parking. There were probably 15 cars parked there today. I stopped there to visit the New Dawn boulders and check out the projects we discovered this past winter. The rock was wet from rain last night but the projects still looked fantastic. Though that side of the gorge stays wet for a long time I knew that in a couple hours the Maryland side of the gorge would be dry. Love Joy Happiness - Catch it, Feel it! 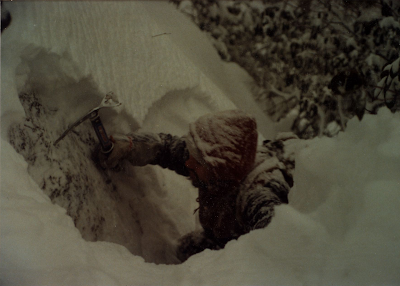 As winter slowly looses its grip on the region I thought it would be nice to look back, way back, at winters past and other historical climbing images related to Rob and the Maryland crew. Most of these photos are from the late 1970's into the early 1980's. You can click on the photos to see larger versions, which I recommend you do. The first set are of Alex Badant on a Shenandoah ice climbing trip. 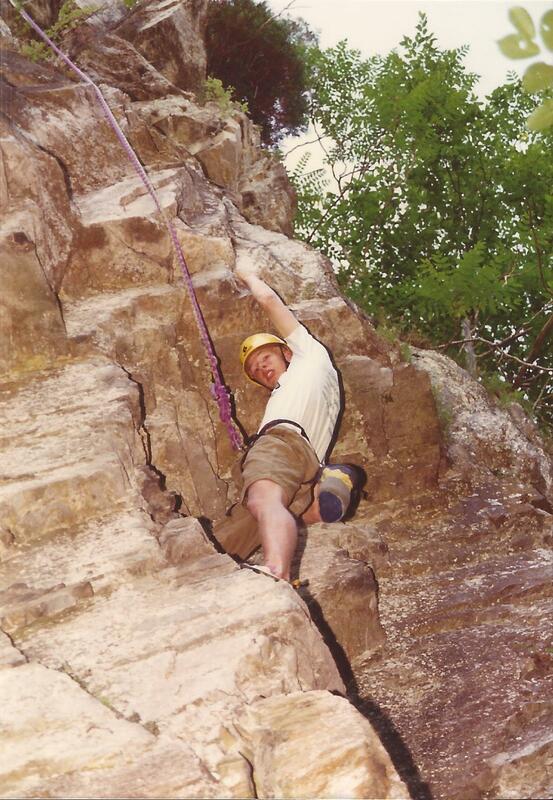 Alex Badant climbing in the Shenandoahs. 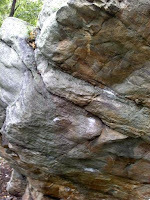 Here is a short video of three boulder problems at the Balcony Rock Boulders, Elk Ridge, Maryland. The problems in order are Y Equals X, X Squared, and X Cubed. The footage was taken over the Christmas/New Years Holiday 2010/2011. Ask yourself this questions and think on it deeply. 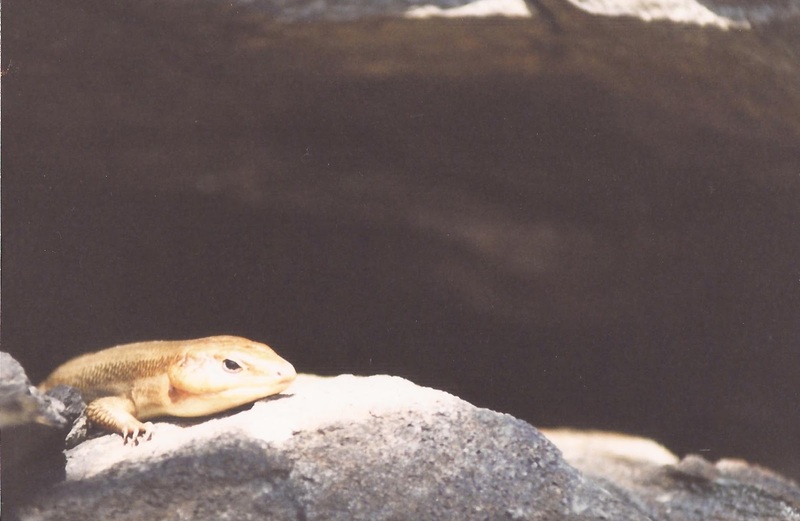 The photograph was taken outside Baltimore, Maryland. Ed Bollack at Ilchester. You can read the story of this photo down below. 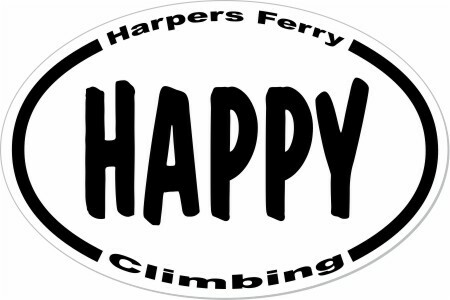 The Harpers Ferry - Climbing History project is underway. Below are a couple images to wet your whistle. We'll work on a full compilation of photos and stories but for now, enjoy these shots. We also have the added bonus of climbing related photos from other locations in Maryland as well as in adjacent states. 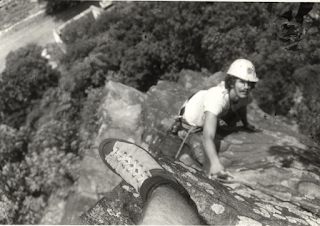 Recent exploits in Harpers Ferry have brought me in contact with a lot of Knifeblades, Lost Arrow Pitons, RURP's, and the finding of long lost climbing gear that was dropped. 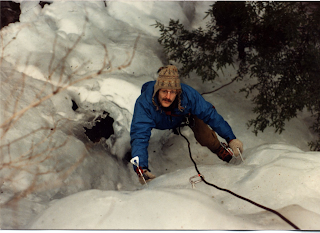 I thought it would be fun to track down the age of 2 pieces of gear to put an age range on what could be the first known ascent of a route or to just get a sense of when the climber who placed or dropped the gear was on that cliff. We ended 2010 Harpers Ferry Climbing with a bang. New Years Eve found us starting the day in Shepherdstown, WV at a great little local restaurant called Betty's Restaurant. The windows were steamed when we approached and the service was warm once we were in side. It's a tiny place on Main Street between the Lost Dog coffee shop and the Shepherdstown Sweet Shop. Betty's serves a great breakfast with some really delicious biscuits and fantastic local sausage from a butcher in Sharpsburg, MD (just 5 miles away). I'd heard about Betty's for years but never stopped in to try it out. I should have stopped in long ago.